In my previous article, I had discussed about the AEM program for linear 2D materials that I had written in Python. Although, poisson's ratio was not considered in that program, I found that when elements are compressed (or stretched) diagonally, an intrinsic poisson effect is induced. However, such poisson effect is non existent when elements are compressed (or stretched) orthogonally. 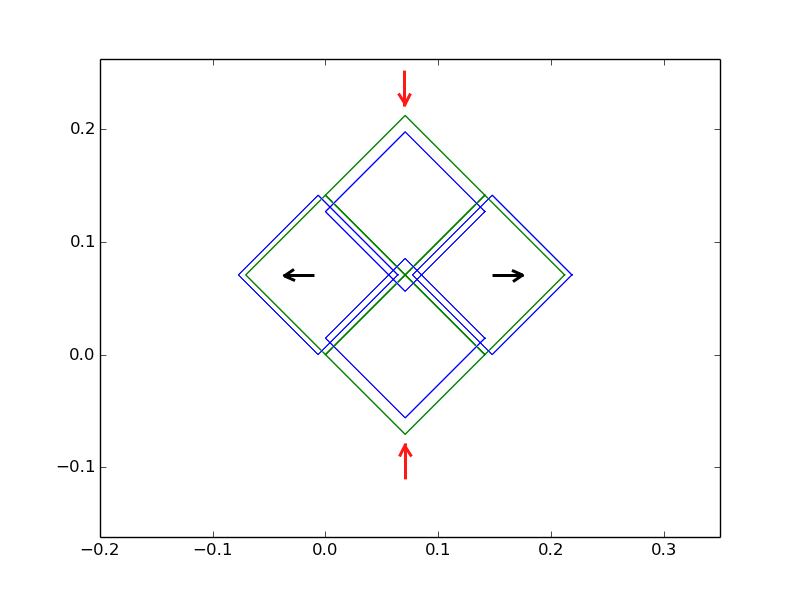 This is mainly because when the elements are compressed diagonally, the diagonal displacement induces extra force on the two lateral elements as shown in figure 1. Also in all of the figures presented here, green squares represent undeformed elements and blue squares represent deformed elements. Displacements are magnified 500 times. Figure 1: Lateral displacements induced (represented by black arrows) when force (represented by red arrows) is applied in a direction diagonal to the element edges. This is the intrinsic anisotropic poisson effect induced in the basic applied element formulation. I first came to know about the Applied Element Method (AEM) during the one day seminar on "Geotechnics and Geo hazards" 2012 held in Nepal. Ramesh Guragain had mentioned this method in his presentation on the study of collapse of masonry structures (and something to do with fragility functions I believe). The results he showed using AEM were really compelling. I wanted to learn more about this method. Here I discuss the basic procedures that I have followed to develop an AEM program on Python that can solve Linear 2D structural problems. Poisson's ratio is not considered here. All of the procedures discussed below are based on Meguro and Tagel-Den (2000). The developed program is then used to solve a classic cantilever beam problem. The displacement values obtained using AEM are compared with corresponding theoretical values and values obtained from Finite Element Method (FEM) for plane stress condition. AEM performs better compared to FEM even when the number of elements is small. where E and G are Young's and shear modulus, d is the distance between springs, T is the thickness of the element and a is the length of representative area.